So who should I run into in downtown Eugene but Ken Kesey, the great Oregon novelist who wrote “One Flew Over the Cuckoo’s Nest?” Kesey passed away in 2001 and no, the late author’s presence wasn’t the ultimate prank from the Merry Prankster himself. 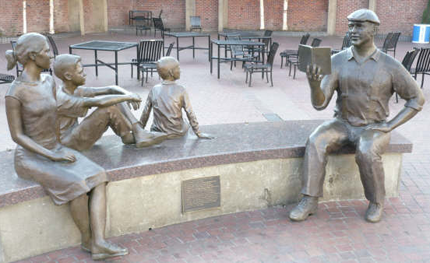 But a bronze statue of Kesey, in the pose of a storyteller with his own grandchildren, was one of the many pleasant surprises I encountered on the streets of Oregon’s second largest city. Another nice surprise was observing how Eugene has changed and mellowed since its rambunctious hippie days, when Kesey and his Deadhead friends reigned supreme in this college town that is the home of the University of Oregon. The change is surely symbolized in the statue itself, which is the focal point of a downtown plaza at Broadway and Willamette streets. It’s Kesey the grandpa, who, after the huge success of two novels set in Oregon, has become the sweet and playful storyteller. Kesey the wacky Prankster in tie dye has long since faded into the shadows of memory. Similarly, the tie-dyed T-shirts offered by so many vendors at Eugene’s Saturday Market seem lost in a distant time warp, retro souvenirs of a bygone era. And by the way, whatever happened to the revolution that so many of the hippies back then eagerly anticipated? I have news for you. It’s here. And it’s green. The hippies won, and really did make a difference. Welcome to Green Eugene. The Green Revolution happened slowly but inexorably in what was already a hotbed of natural, healthy living. And it was all those sprout-munching, establishment-hating groovers who laid the foundation for it 40 or so years ago. As I quickly discovered in my walk around town, it’s easy being green in Eugene, where shopping, eating, transportation and recreation all cater to the sustainable lifestyle. There are so many natural foods stores, restaurants and manufacturers in Eugene that eating poorly would be nearly impossible here. One of the original food producers is Springfield Creamery, which has been owned since 1960 by the Kesey family. Their most popular product is Nancy’s Yogurt, developed in 1970 from a recipe belonging to one of Ken Kesey’s friends. Nancy Hamren is now the company’s quite respectable bookkeeper and the yogurt’s namesake. She came to Eugene from San Francisco in 1969 when Kesey asked her and her boyfriend to help look after the family farm while he was in London recording his stories for The Beatles. Toby Alves is another leading producer of natural foods. Her company, Toby’s Family Foods, sells salad dressings and the tofu paté that has been a hit at the Eugene Saturday Market almost since the open-air crafts market opened 39 years ago. You’ll still find Toby’s colorful booth, Tofu Palace, in the food court, serving up specialties such as the Tofu Tia (a vegan burrito). In the good-old hippie days, Toby lived with her family in a converted bus. Their style of eating and cooking was vegetarian, but it hadn’t taken as strong a hold in Eugene as now. Her three kids, in fact, were getting teased for the weird food their mom packed in their school lunches. Toby developed her tofu paté, which resembles egg salad, to keep her kids from getting teased. Pretty soon all the kids (and their moms) wanted the yummy spread for their sandwiches, too, and a business was born that survives today. Some of the many natural foods groceries sprang from similar roots. The longest operating one in Eugene is The Kiva, which opened downtown in 1970, selling food and books. Kiva is a word from a Native American language that means “safe place.” As a longtime clerk explained it to me, the hippies often felt persecuted for being different and all they really wanted was a safe place. They found it in Eugene. Another old-timer is Sundance Natural Foods, a Eugene staple since 1971. In addition to an extensive bulk foods section, where I went wild scooping exotic varieties of grains into small paper bags, Sundance offers an all-vegan salad buffet and hot food buffet. As for restaurants, Café Soriah is a longtime local favorite for its Mediterranean flavors fashioned from fresh, local ingredients. Ratatouille is a popular choice for vegetarians and Café Yumm! serves fast food that’s vegetarian and all natural. And if it’s vegetarian pizza you crave, options abound in Eugene. A good place to try is the Pizza Research Institute, a funky hole-in-the-wall eatery where you can find such delicious concoctions as apple-smoked gouda-roasted walnut pizza. Can anything this good really be good for you, too? Morning Glory Café, situated across from Eugene’s train station, is a good choice for breakfast. The restaurant’s “conscious kitchen” features vegan and organic food and bills itself as cell-free and hate-free. Try the Three Sisters: potatoes, mushrooms and veggies topped with, among other choices, tantric mushroom gravy. Expect to pay a 25-cent “eco tax” for take-out containers. And for a (relatively) healthy treat, there’s Prince Puckler’s Ice Cream, just a few blocks off the University of Oregon campus. Home-made ice cream with local, natural ingredients is featured. The chocolate sundae is decked with a locally made confection, Euphoria chocolate sauce. If you’re in the mood to shop in Eugene, several stores cater to the sustainable lifestyle. And if you’d rather not walk, you can ride the buses guilt-free. They’re hybrid -- and free! Tote your recyclable shopping bag to Down to Earth Home, Garden & Gift, to stock up on household and gardening goods made from mostly natural, recycled and biodegradable materials. The main store, open since 1977, is part of the Farmers Union Marketplace, which includes Green Store, The Beanery and Paul’s Bicycle Way of Life. In Eugene, nearly everyone rides a bike. There are about 150 miles of bike paths, most notably the scenic biking and hiking paths of the Ruth Bascom Riverbank Trail System, which roll along both banks of the Willamette River and are linked by five bicycle/pedestrian bridges. The healthy denizens of Green Eugene go by water, too, and on a nice day you’re likely to see plenty of kayakers and canoeists on the river. After a long and vigorous day of exploring Eugene, preferably on foot or by bike, plan on spending the night at the Eugene Hilton. A recent renovation turned it into Lane County’s first green hotel, with eco-friendly materials, cleaning products and practices.